Great deal on Saturday, Sunday and Monday this weekend (May 21,22,23) at Shopper's Drug mart. 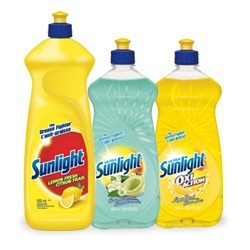 Sunlight Dish soap is on sale for .99 cents each for 500ml-625ml. Limit of 4, after limit and the rest of the week they are $1.99. Now is the time to use that Sunlight coupon from Save.ca for $1.00 off! That is exactly what I did....I had a pretty good shopping week this week....retail bill of $275 and I paid $150.....not bad.....and with that free bottle of sunlight!